Which Kitchen Flooring Material is Best? The timeless beauty and allure of tile flooring is perhaps the biggest reason why it’s becoming increasingly popular among homeowners. In particular, tile is widely preferred for kitchen renovations, thanks to its versatility and durability. Still, most individuals find it hard to pick the best kitchen floor tiles for their homes, which is why you might want to familiarize yourself with some of the options that are available to you. As a tile store in Anaheim, we have compiled a list of our favorite materials for kitchen floor tiles. Porcelain tiles are known to be harder, tougher, purer and stronger than their already sturdy counterparts. This is because they’re usually fired at higher temperatures, something that boosts their density. As a result, porcelain tiles are usually resistant to cracking, and need little in the form of maintenance. Considering that porcelain tiles are also capable of withstanding moisture and fire, it’s easy to see why porcelain is one of our favorite materials for kitchen floors. Historically associated with wealth and opulence, marble is one of the most elegant materials you could choose for your kitchen. Installing marble tiles in your kitchen will create a sophisticated atmosphere that will be carried to all parts of your home. Aesthetic appeal aside, you might also want to choose marble tiles for the sake of durability and resistance to scratches. Marble tiles also have a translucent attribute, and while slight, could further enhance lighting in your kitchen, thus making the environment safer. Travertine is a limestone variety that occurs around mineral spring deposits. Its use as a flooring material dates back thousands of years, but it can also be used for backsplashes, countertops and other areas where tile is usually preferred. Travertine tile has the ability to withstand extreme fluctuations in temperature, durability and excellent traction are a few of the reasons why one might consider travertine flooring for their kitchen. If properly installed and maintained, it would definitely enhance the interior decor of your home. Previously known for its toughness, ceramic’s popularity has exploded in recent years, mainly due to its decorator effect. Being significantly softer than its porcelain cousin, the material is usually easier to cut and install. And while you could use ceramic tile in the majority of your home, there are a few good reasons why you’d want to choose ceramic tile for your kitchen flooring, such as; Easy maintenance: Regular sweeping and mopping is all it takes to keep ceramic tiles as good as new. Moisture resistance: This means you won’t have to worry about spills from the typical fluids in your kitchen. Resistance to odors and fire. As such, ceramic tile is a practical, functional choice for your kitchen floor. 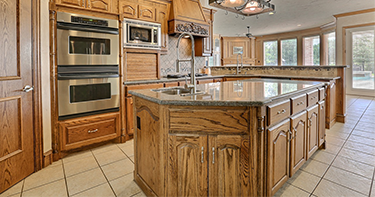 Granite is a quartz-based stone that has emerged as the material of choice for kitchen applications. This is all thanks to its hardness, durability and ability to resist water seepage. Granite tile is also known to be resistant to allergens, which further enhances its popularity as a flooring option. Installing granite tiles in your kitchen could actually enhance the value of your home, thanks to the unique appeal created by the stone’s variegated texture and color. Tile floors are an excellent choice for most kitchens. If you’re ready to see more kitchen floor tile design, please give us a call or simply stop by one of our tile stores in Orange County. We have locations in Costa Mesa. Anaheim, and Laguna Niguel.